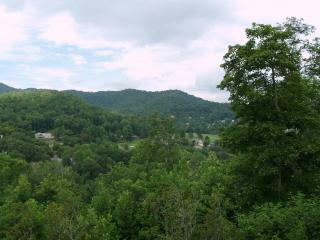 Mill Creek Country Club 2/2 Home Overlooking Golf Course! 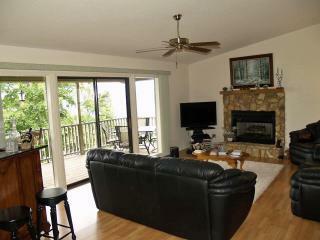 Fantastic mountain views from 2 Bedroom, 2 Bath home in Gated Golf Course community- Mill Creek Country Club within short driving distance to Ashville, Smokey Mountains, Blue Ridge Parkway, gem mining, lakes, fishing and cool mountain air. This almost new (2005) lovely home has a huge front porch 8' X 50' with porch rocking chairs, chaise lounge and glass picnic table with chairs for dinner as you watch the sun sinking over the Nanathahala mountains. Large Living Room with sectional couch with pull out queen sized bed, recliner, large screen TV with DIRECTV satellite (local channels plus upgraded package), DVD, VCR and video library including some children's movies. *** NEW*** Free Whole House Wireless Internet! Full Glass Storm door allows you to keep front door open for mountain views at all times from living room (or pull up screen to enjoy mountain breezes) . 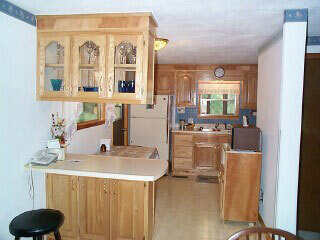 Vaulted ceilings in Living room and kitchen. Kitchen is fully equipped with newer refrigerator with ice, crushed ice and water through the door, smooth top stove with microwave above, dishwasher, disposal and all dishes, flatware and small appliances. Cookware is adequate and newer. Dining room has rattan glass top table and rattan chairs with hanging chandelier overhead. The bedrooms are arranged as two separate master suites and are the same size, each having its own bathroom which is almost as large as the bedroom. 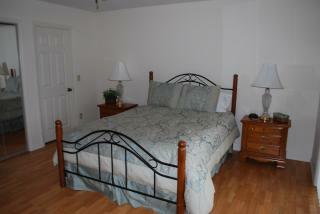 One bedroom has a king sized bed, TV, ceiling fan and private bath. The 2nd bedroom has a queen sized bed, 19" TV and entertainment center with plenty of storage space, as well as a large private bath. 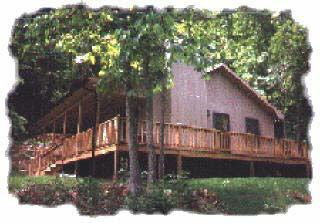 Both bathrooms have large walk in showers with dual seating in each shower, double sinks and plenty of linens. Weekly Rates $695.00. 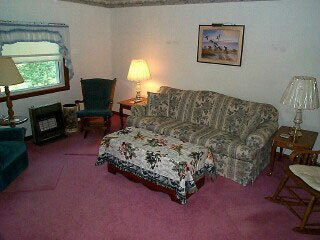 SPECIAL $600.00/week Nightly: $115.00/3 night minimum. SPECIAL: $100/night...Call for more information. 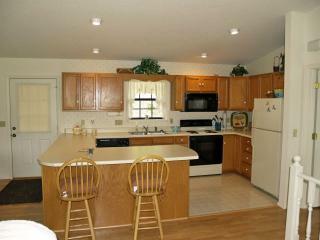 Lovely 2/2 Home in Mill Creek for Rent! 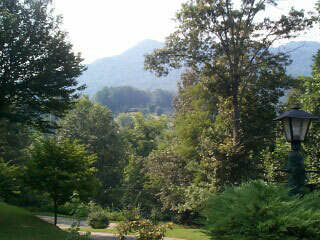 Come enjoy the splendor of the Beautiful NC Smokey Mountains! 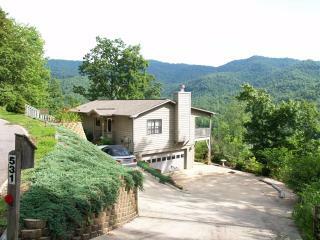 This gorgeous 2 bedroom, 2 bath home is conveniently located in Mill Creek Country Club, Franklin, NC's premier gated Golf Course Community surrounded by the Great Smokey Mountains National Forest. When you walk in to this home, you immediately start to enjoy the privacy and beautiful views off of the inviting full length covered porch. The spacious living room/dining room/kitchen features cathedral ceilings, large dining table and breakfast bar, as well as cocktail hour bar. NEW Leather couch and love seat invite you to spend a cozy evening in front of the gas log fireplace or watching your favorite channel on the flat screen TV with Direct TV. 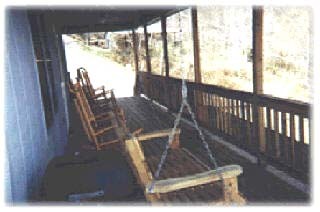 Oversized sliding glass doors open onto the porch which features glass topped table with 4 chairs, as well as rocking chairs, and propane heater for those cool nights. The main floor features a large master bedroom with NEW king sized bed, large bath with walk-in shower, dual sinks, and linen closet. The master closet also has a laundry chute to the lower level for added convenience. 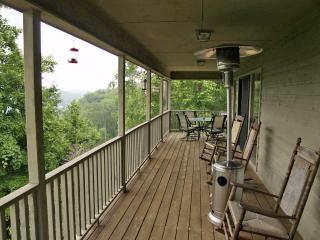 Sliding glass doors open onto the covered porch for a lovely view of the sunrise over the mountains. 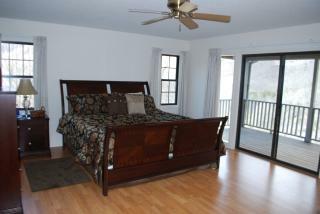 The lower level features another large bedroom which opens onto the full length porch/patio. Add additional bath, large closet with plenty of extra blankets, an aero bed (the additional queen sized bed), and bottom of the laundry chute as the washer dryer are in another closet in this bedroom. 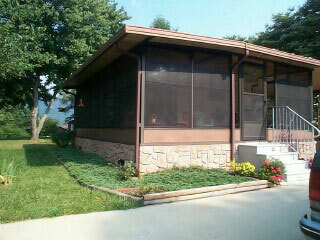 The over sized garage houses the deluze gas grill as well as additional patio furniture. This beautiful rental cottage is perfect for the family who wants to get away to a view of surrounding mountains and the ease of quiet and relaxation. 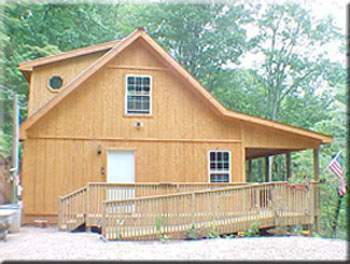 Located only six miles from Franklin, this fully furnished, 2 bedroom, 1 bath home includes Satellite TV, VCR, W/D, M/W, screened-in porch, king and queen sized beds, and a queen sleeper sofa--comfortable accommodations for 6 people.